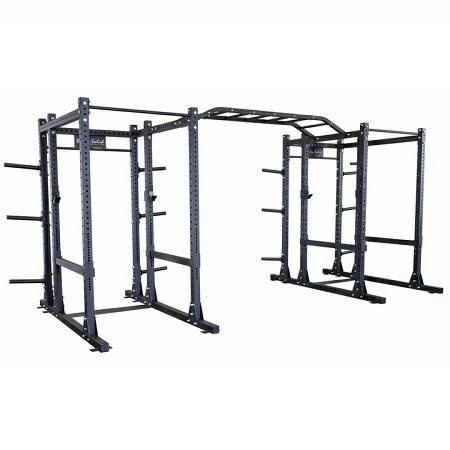 Each of these power racks feature a 3” x 3” 11-gauge steel mainframe and 1000 lb weight capacities meaning they will hold up even through the most strenuous of workouts. The SPR1000’s are 90” tall which is perfect for chin-ups, standing shoulder presses and many other exercises that are compromised on shorter, competitive power racks. The 1” hole spacing for the safety spotter bars means you will always find that perfect stretch without decreasing safety. 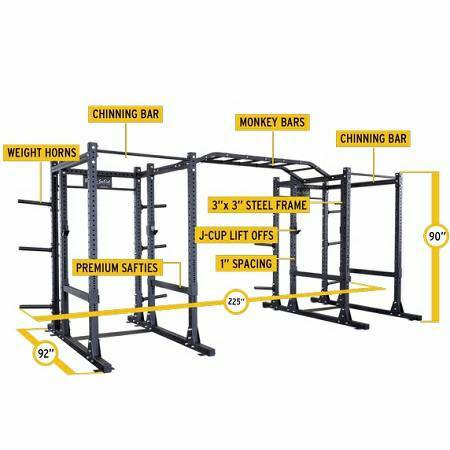 The included SPRMB monkey bar attachment allows you to bolt the two SPR1000 power racks together creating a perfect platform for multiple users or group exercise The optional SPRMB monkey bar attachment allows you to bolt even more SPR1000 power racks together to create your own functional gym or entire room. With a multitude of options and attachments along with the ability to expand and customize, the SPR1000DB Commercial Power Rack Package is the perfect blend of quality, function, versatility and value.